This has been a week! A week of battles good and bad, a week of craziness, of being so tired (I thought I would have to hold my eyes open with toothpicks at one point), a week where the world seems to be spinning faster than you! The first week back to school after any break always is. But this week has contained added pressures, as life always does. I try and be “good” and do my own little set of readings in the morning, so I am mentally set for my day, something to reflect on. I read from a variety of sources, some yoga based others inspirationally based and still others spiritually based. One such spiritual thing I read is a gift from my parents. They give Mr. Michie and me a subscription to Guideposts. It is one of my most treasured gifts. There is always a story in there to make me think, often one that makes me cry. I barely get into an article some days and I am already overcome. It sounds silly, I suppose. The latest issue seems to almost all be about people and stories from the South and more particular from South Carolina, my home state, so it is resonating a little more with me. I usually randomly skip through Guideposts, I know that the story I need to read will be the one I flip to first, so I kind of play it fast and loose and don’t read it from front to back. Last night I lay in bed, my head was pounding, I have had a migraine that is now in its second day of coming and going. I knew I needed to sleep, I knew reading was not a good idea; I should really just be closing my eyes. But as tired as I was, sleep was not coming, so I reached into my pile of books by my bed and pulled out Guidepost. The article I read was heartbreaking, heart warming and yes, it made me cry. There is always a pet section within Guideposts and it usually makes me smile. Animals are amazing creatures. We are an animal family, I have grown up around them. My sister is a Vet with two gorgeous Labs (one black, one yellow) and my parents have a very sweet, very vocal little Jack Russell, who is a little lady through and through. Unfortunately Mr. Michie and I can’t have pets in our cottage, but one day we will have a dog. Animals and dogs in particular are little angels here on earth. They bring so much JOY! They are intuitive, non-judgmental and intelligent; they are an excellent way to bring someone out of their shell, or to bring someone a bit of peace. Dogs are FULL of unconditional LOVE! Last night the story that jumped out at me was about a woman named Barb who is a dog handler in Chicago and her Golden Retriever named Hannah. Hannah is a special dog; she is a “comfort dog”. She goes where people need her. She is specially trained to stay, to be cuddled, to be petted, to be loved. When the terrible events of Sandy Hook Elementary school took place, Hannah and her handler packed up their car and drove there. They arrived 2 days later, to offer comfort where they could. I know, like many others, I wrote about this incident, it still haunts me. Will there ever be peace for those families? Will there ever be a true resolution as far as legislation goes, one that makes sense? This story touched me last night as I lay in bed and I have thought about it all morning. One piece in particular was about a small boy who had barely spoken since the shooting, Hannah and her handler helped to bring this boy a measure of peace. After reading this article, I just laid there thinking, what problems do I actually have? Guidepost always has a way of humbling you. And, I thanked God for special people like Barb and very special animals like Hannah who work to make this world a better place, for they are the silver lining in the cloud, they are the good that comes out of the bad, they are the peace and the love and the light. The tragic shootings at Sandy Hook brought all of us together, including God’s most sensitive creatures. I grabbed the phone on the third ring. I was babysitting my grandkids on a Friday night in mid-December. All day I’d been so busy I’d never even switched on the computer. “Hello,” I said, trying not to sound rushed. My eyes flew to my grandkids, four and two and a half, sitting contentedly on the couch. Not much younger than these children who’d been…slaughtered. 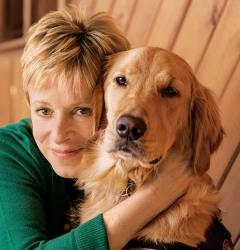 Beside them was Hannah, my service dog, specially trained to give comfort to trauma victims. Sharon and I both were volunteer handlers. I’d wanted to be a help to people. But was I ready for such a huge undertaking? Was Hannah? She was just a puppy, 11 months old. I’d only had her for a few weeks. But it was more than that. A handler’s job is to stay in the background, to not show emotion. I looked again at my grandkids. How could I do that when 20 children were dead? Twenty sets of parents facing the worst moment of their lives with virtually the whole nation watching? I’d have to talk to Tim Hetzner, the director of Comfort Dog Ministry. For years we’d gone to the same Bible study. It was listening to his amazing stories of how the dogs touched the lives of children and adults alike that inspired me to become a handler. Tim had started the program in 2008 after a gunman had killed five people at an Illinois university. He and some other church members had taken their dogs to the campus, hoping to offer compassion in whatever way God led them. But he hadn’t anticipated the full impact of an animal in traumatic situations. He’d found that dogs were able to connect with the students and faculty in a way that no one else could. Tim founded Comfort Dog Ministry, part of Lutheran Church Charities. It had grown into a team of 60 dogs and handlers, with months-long training for new dogs when they were just puppies, provided by prisoners at an Illinois penitentiary. Golden retrievers, known for their sensitivity, were the breed of choice. The team had gone to Joplin, Missouri, after the tornado there. And to New Jersey after Superstorm Sandy. But most requests were from people in the area, after fires and on oncology wards, for school programs, nursing homes and the like. I had known it wouldn’t always be easy. But this was way different. The whole nation was grieving. Dear God, I prayed. If you think I’m not ready I’ll let someone with more experience go instead. That night in bed I talked to God until sleep finally came. I don’t know how to do this, I said. How can I not respond when they’re in such pain? I cry too easily. And Hannah. I don’t know if she has the patience yet. Maybe if she was older. In the morning I woke with an unmistakable feeling: Hannah and I needed to be in Newtown. I thought of those families and how in an instant their lives had been shattered. We couldn’t back down. Okay, God, I’m going, I thought. I still wasn’t sure I had the strength to look into the face of such terrible grief, but I knew I would never find out unless Hannah and I went to Newtown. Sharon too felt called to go, with her golden, Maggie. I had to pack. “I’ll pick you up in an hour,” I told Sharon on the phone. It was a 14-hour drive, a two-day trip. Two days to think about what was ahead. I looked at Hannah and wrapped my arms around her. “We can do this,” I whispered. Hannah had been trained to stay calm at all times, to be comfortable with being stroked and nuzzled. But in the confines of the prison she hadn’t seen children or any of the distractions of the outside world. That was my job, to socialize her. I’d gotten her on Halloween. I’d taken her to schools and to parks, places where there were lots of people, to a concert and once to a funeral. Hannah and I had gone with the team to a program in early December at O’Hare airport for terminally ill children—a Polar Express kind of event, complete with a plane ride to the “North Pole” to see Santa—and his dogs. A great night, tinged with sadness, of course, but the kids were happy to be there, smiling and laughing. It was magical. Not like Newtown. Not like the Sandy Hook families. I clung to that memory as we drove. Sharon and I did our best to support each other. And pray. We prayed all the way. We arrived late Sunday afternoon. Nothing could have prepared us for the scene as we drove into the central business district of Newtown, a quaint picture-postcard New England village. Hundreds of people milled about the town square amid throngs of TV news reporters and camera operators, sending out images to a nation in mourning, to a world in shock. I found a place to park and put Hannah’s service vest on her. She seemed to sense that she was about to be tested. Sharon, Maggie and the rest of the team joined us as we made our way through the crowd. It was freezing cold. But what I noticed more was how quiet it was. No one spoke. It was eerie. You could feel the sorrow and a pervasive sense of despair. It weighed on me. There was nothing to say. Nothing anyone could do to heal the wound. We reached an opening in the crowd and there in the center was a Christmas tree, lit with colored bulbs. Many in the town had taken down their holiday displays. This lone tree was the town memorial. All around it people had left flowers and teddy bears, photos of the victims, letters and poems. And a sea of candles. I felt myself coming apart. I looked into the faces of the people around me, police officers and firefighters. Stunned, shell-shocked, haunted. I wanted so badly to shake their hands, to thank them for their service, to tell them that God was here among us. But I couldn’t. All I could do was stand there with Hannah and do nothing. When would the pain ever lessen? I wondered. When would anyone feel comforted? How was that even possible? A firefighter came over to us, knelt down and stroked Hannah’s head. “Hey, girl,” he whispered. He looked up at me. “Thanks for coming. It means a lot. More than you know.” Lines rimmed his eyes; his face was drawn. I couldn’t imagine the horror he’d witnessed. More people noticed us. A small crowd gathered around, everyone wanting to pet the dogs, to talk to them, just wanting to be close to them. Especially children. One little girl wrapped her arms around Hannah and cried into her fur. A newscaster edged up to us, the lights from a TV camera blinding. “Can you tell me what brought you here?” he asked. I looked at his face. He had tears in his eyes. Hours later Sharon and I drove back to our hotel room. Neither of us said a word. I was exhausted, drained by the raw emotions. In bed I pressed my face into the pillow. Dear God, I prayed. I don’t know if I can do this day after day. Please help me, help me know that you’re here. Help Hannah. I am worried this might be too much for her gentle heart. The next morning we went to the community center and were ushered to a hallway just inside the door. It was 7 A.M. and already the building was filled with people. Many were young parents with toddlers and preschoolers. But even the little ones were quiet, staying close to their parents, small hands gripping bigger ones. Their world was suddenly a frightening place. Their innocence stolen from them. No one smiled. Few made eye contact. I stood there waiting. Hannah sat by me, her eyes riveted on the children, as if she could sense their sadness even from a distance. The boy looked to his mother and she nodded. He knelt down next to Hannah and stroked her fur. Barely a trace of emotion. Lips pinched tightly together, as if he were holding the whole world inside. It was heart-wrenching. Even Hannah couldn’t reach him. Hannah moved her great head. She nuzzled the boy’s face. All at once he wrapped his arms around her neck. He buried his face in her fur, arms squeezing tight. But Hannah didn’t resist even as his tiny hands tugged at her. She seemed to lean in to him. I couldn’t tell at first if he even heard me. And then he raised his lips to her ear and said something. His mouth kept moving, almost silently, until finally his hands relaxed. He patted Hannah on the head. And smiled, just for a second. Not a huge grin. But it was enough. “I’m glad we could be here,” I said. “God bless you.” But as they walked away I thought about how little I’d done. Nothing, really. Hannah and God had done all the work. For a week Hannah and I ministered to dozens of families and children, police officers and firefighters. A week of moments shared by a dog and a person who was struggling to find hope in a senseless act of mass murder. Too soon we had to leave. We left a community still deep in sorrow, with many difficult days ahead. But they weren’t alone. Far from it. Together we’d see each other through even this. In the presence of our greatest pain there is always one great healing power that reaches us in profound and unexpected ways. On the way back to Chicago, Hannah and Maggie settled in comfortably. They slept almost all the way home. This entry was posted in Life and tagged Comfort Dog Ministry, dog, faith, Guideposts, Life, love on June 6, 2013 by jennifermichie.